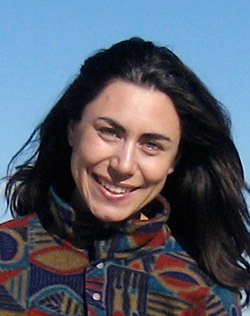 Tanja Bochnig is the founder of Aroma Yoga. The potential benefits of a combination of aromatherapy and yoga opened up to Tanja in the mid-nineties. Her career demonstrates how her understanding of Aroma Yoga developed. At the young age of eighteen, she began her career as a model, which brought her quickly to the fashion capital, Paris. Five years later, and after a brief stopover in London, she moved to New York. Despite the great success in her work, her real interest was something quite different. Aromatherapy, yoga, herbal medicine, homeopathy and many other natural healing techniques were Tanja’s true passion and pleasure. Courses and training followed, allowing her enthusiasm to mature into a profession and a calling. In particular, she has trained in the yoga styles Hatha, Vinyasa, Jivamukti, Kundalini, and others, and has been certified by two training courses as a yoga teacher. With an almost greater passion, she also completed training as an aromatherapist and natural perfumer, and attended countless workshops, courses and lectures on these topics. The daily practice of Tanja’s two biggest passions, led naturally to the desire to make the two one. Aroma Yoga is the quintessence of great experience that will ripen in one’s own body and the soul. 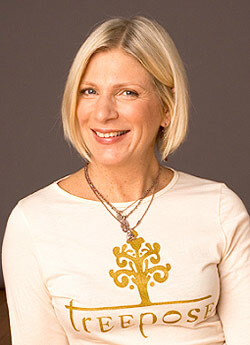 In various yoga schools in New York, Tanja taught ongoing classes in Aroma Yoga and offered regular workshops. In practice, the exercises continuously refined, and every day, the rich knowledge of Aroma Yoga gave students a valuable, tangible and lasting experience. Rita Trieger is the founder and editor-in-chief of Fit Yoga Magazine, and the author of Yoga Heals Your Back (Fairwinds, 2005), and Tranquil Mind, a yoga/meditation CD. She incorporates a variety of traditions into her inspiring teaching style, and has cultivated an enthusiastic following in both vigorous Vinyasa flow classes, and healing restorative classes. She currently teaches yoga and meditation in Connecticut at The Health and Fitness Institute at Stamford Hospital, Elements Yoga in Darien, the Bennett Cancer Center, and Stamford Hospital’s Center for Integrated Medicine, as well as various studios and private homes in her hometown of New York City. Over the last year, Rita has enjoyed teaching a series of AromaYoga Restorative workshops. Not surprisingly, they’ve been wildly successful -- mostly because people desperately need to relax, and also because aromatherapy is so powerful. Rita would like to offer a heart full of gratitude to Tanja Bochnig for sharing her wealth of knowledge and providing ongoing inspiration. 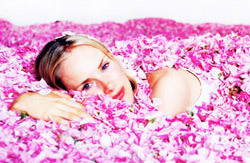 Her beautiful, pure, organic fragrances have enriched the experience of the workshops beyond anyone’s expectations. Melissa Lago, M.A., grew up in California and began studying yoga when she was 15 years old as a way to calm her mind and merge her love for movement and dance with meditation. Throughout high school and college she studied Ashtanga Yoga with Tim Miller, and later branched out to study Vinyasa Flow, Anusara and Kundalini Yoga. After graduating from Yale University in 2004, she moved to New York City, where she took her first private Aroma Yoga class with Tanja Bochnig. The synergy of the essential oils and asanas brought her a profound sense of well-being, deeper than she had experienced from practicing the asanas alone. She knew after her first class that she wanted to offer this experience to others and in the spring of 2005 she began assisting Tanja and later teaching on her own. She has completed an Ashtanga Yoga teacher training and is currently in Shiva Rea’s Prana Flow Yoga teacher training. At the heart of her teaching is her intention to inspire people to live more fully by becoming more aware, and through awareness to open to their own healing, joy and transformation. Melissa recently completed her masters in Philosophy and Religion at the California Institute of Integral Studies and offers private group and individual yoga classes in northern California. She can be reached by email at melissa.lago@gmail.com or by phone at (831)236-4528. Her website www.yogatransforms.us will be coming soon.